the first time we have got in contact was before the earthquake hit japan. then hiyoko imai was in japan. fortunately, she came back safe. thus you can follow our little "small talk" today. 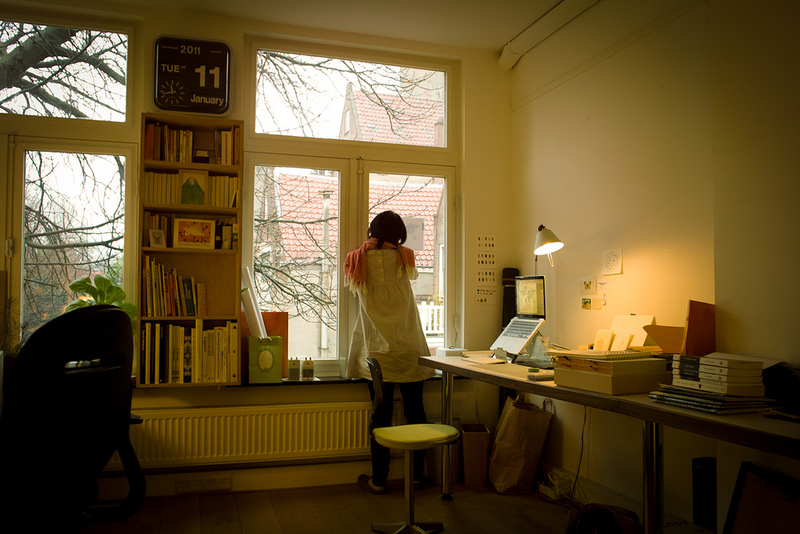 i am a tokyo-born illustrator or designer living in amsterdam. Love craftsmanship, minimalism, gardening and food culture. all of my paper illustrations are made of traditional japanese paper with very warm, natural texture and colors. every single piece of every composition has been but and pasted by hand. no photoshop here! purely hand-made. the dutch call this ‘monnikenwerk' (monk work), as it requires lots of patience and accuracy. i always very much enjoy the process of making these compositions as i care about details and geometrical yet organic shapes. and although this comes across as perfectionism, the charm lies also in its imperfections. imperfections that are the signature of hand-made art. my paper series, ‘mont petit’, consists of stacked tiny triangles (± 3 mm wide) and turns out to be my most representative piece of ‘monnikenwerk’ to date. right now i'm working on the new collection, and it will be available at the mont petit webshop very soon. artists: charley harper, isamu noguchi, richard tuttle, sol lewitt and many more. my husband and i have just started a project called 'tanemaki'. tanemaki is japanese and translates as “to plant” or “to seed”. our tanemaki project reaches out directly to kids and their communities in tohoku-area and helps them re-build their lives. we like to plant initiatives in their destroyed communities; to seed hope for a positive future. this is a fun and creative project that many people can involve in various ways. we will be organizing the fundraising events and workshops here in amsterdam and also in japan. all the proceeds from my webshop go to our tanemaki project, too! you can find more information at our tanemaki site. what makes a felicitous illustration? thanks so much for answering my questions, hiyoko.